Rithika is using Smore newsletters to spread the word online. 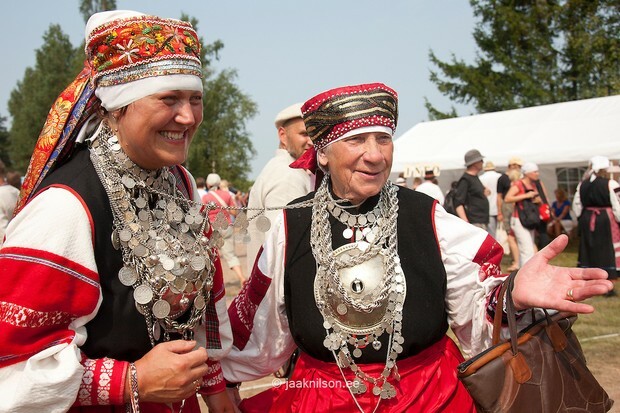 Estonia is a small little country in the Northeast area of Europe. It is a beautiful country that is almost surrounded by water. Because of the huge amount of water available there are many ports, so many cruise ships come in from there. The weather can get a little chilly and snowy in the winter, but July is its hottest month. In the winter, the lows range from low 22's to low 30's. The highs range from mid 30's to low 40's. In the summer the lows range from 50's to 60's. The highs range from 60's to 70's. Estonia is a very flat low land close to sea level, so its highest peak Manumagi is only 50 meters high. Some of the lakes are called Peipus, and Pskov lakes. The major rivers are Parnu river which is in the western side. Plus the Emojogi river which is in the very East part of Estonia. The major cities are Tallinn, Narva, and Tartu. But Tallinn is the most populated. It is the capital of Estonia. It has many interest points including Kiek de in Kok, a defensive cannon tower. Plus medieval castles. Tallinn houses many cafes and shops. Tallinn is small yet beautiful city. 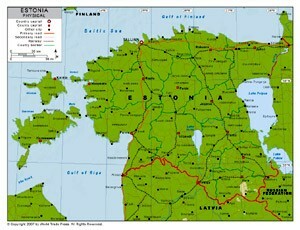 You can travel there by airplane, and there are many taxis and buses to take you within Estonia. Also since Estonia has access to a lot of water, there are many ports. 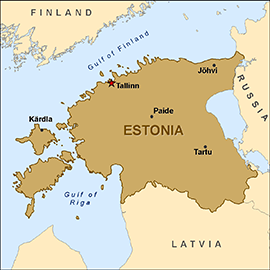 Estonia has a Parliamentary republic. It is a limited government. The president is Toomas Hendrik Ives. The United States system of government is very similar to Estonia's government. We both presidents, and legislative systems, and we have elections. But they have a parliament, and we don't. We are divided up into national and state powers.We have similar rights as they do. Estonia is really good about rights of the citizens and fair rule. Estonia is part of the UN. Estonia's currency is Euros. 1 Euro is equal 1.11 US $. It is the 77th largest economy. Some of the exports are refines petroleum, insulated wire, and large construction vehicle. Some of the imports are refines petroleum, cars, passenger and cargo ships, and telephones. I would say that Estonia is not as wealthy as the United States, but it does have a good economy in Europe. Freedoms between men and women are the same. 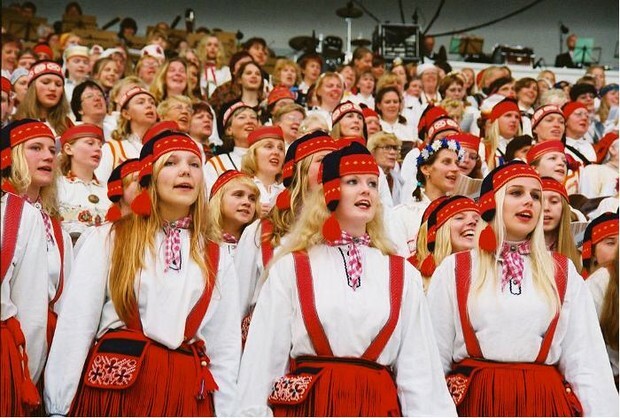 The literacy rate of Estonia is 99.9. This tells us that they are very serious in their education, and are highly educated. 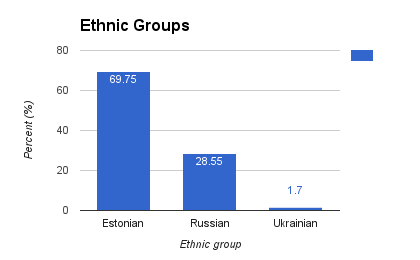 The ethnic groups are Estonians with 69.75 %. Then there are Russians with 28.55 %, and then Ukrainians with 1.7 %. They do not have much fighting going on right now, but they do have tension to Soviet Union and Baltic German forces due to previous wars. Plus Russia due to other issues and abductions. 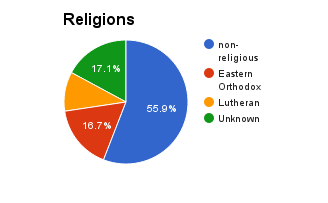 54% are non religious, 9.9% Lutheran, unknown 16.55%, and eastern Orthodox is 16.15%. The official language is Estonian. The flag was created November 21st, 1918. The blue represents loyalty, and the skies. Black represents the fertile soil, and the oppression. White represents the struggles for freedom, and virtue. 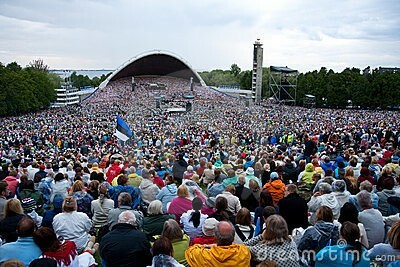 Estonia has a song festival every 5 years in Tallinn. The best choirs get together to sing and entertain over 25,000 people. It is an open-air concert. It is a very emotional time. Every day wear includes t-shirts and things that we wear but also include things like what you see below this text. Beneath that is what people wear for festivals and holidays. Here is a recipe for Estonian soda bread. Mix in the ricotta mixture. Add in the oil and combine. Grease a springform pan (23 x 23) or line with parchment paper. Bake at 200 C for 25-30 mins.